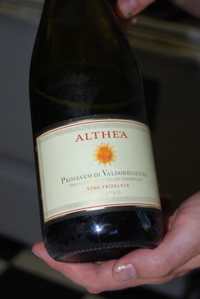 Prosecco is the name of a white grape and sparkling wine made in Itally. Traditionally produced in the northeastern Italian region of Veneto (surrounding Venice), these sparkling wines are typically light and fresh, excellent as an apéritif or to accompany light foods. Compared to sparkling wines like Champagne, most of these wines tend to be much lighter in body and less bubbly. Most are what the Italians call Frizzante, roughly meaning fizzy. These have a delicate sparkle but without the high pressure, thick mousse of Champagne. Some producers make a higher pressure wine which is often labeled as Spumante. Besides being refreshing, lively and delicious, these are also ideal sparkling wine options because of their price. While most good Champagnes and other sparkling wines start at around $30 and move up quickly from there, most of these Italian sparklers are under $20 and some even under $10! While most may not have the longevity, depth and complexity of the best Champagne has to offer, they make for fun and delicious sparkling wines that won't break the bank. These inexpensive sparkling wines, particularly the Frizzante, tend to be light, crisp and lively, making them an outstanding, fun apéritif. They do nicely with light fare as well such as many light creamy cheeses (brie, chevre, etc.) and finger foods like an antipasto plate or bruschetta. The richer Spumante versions can be served much like a Champagne or other sparkling wines, pairing nicely with some richer foods and cheeses as well as the things mentioned above. Above all, Italian sparkling wine is about fun and enjoying life. So pour a glass for you and your guests and enjoy yourselves! Done with the Prosecco page?